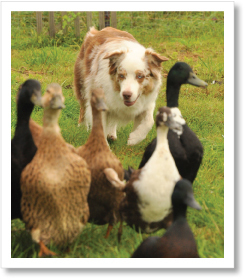 The Australian Shepherd Health & Genetics Institute, Inc. (ASHGI), established in 2002, is a 501(c)(3) organization. Our breed is one long praised for its versatility. We can boast in-the-trenches working and service dogs; top competitors in agility, conformation, obedience and stockdog trials; and beloved family companions. These many areas of activity involve people of differing backgrounds and goals, but canine hereditary disease is a reality for all of us. Hereditary diseases are a growing breed issue. Without access to information about those diseases, breeders and owners cannot make informed decisions. Without research specific to Aussies, modes of inheritance will not be determined for our breed, nor will DNA screening tests be developed. Research requires both data and funding, both of which must largely come from people within the breed. ASHGI is dedicated to the increase and diffusion of knowledge of genetics in the Australian Shepherd, and the inherited diseases from which it sometimes suffers. We envision serving all Aussies, no matter what their purpose, the goals of their owners, or where they live. ASHGI will work both independently and in cooperation with researchers, breed clubs, canine health organizations and foundations that provide grant funds for canine genetics research. We have created ashgi.org to provide information about ASHGI and Aussie genetics and offer links to other sites of interest.